Grandma P and I have just returned from a 28 day Pacific cruise. It was wonderful. We visited four of the Hawaiin Islands, three islands in French Polynesia, American Samoa and Western Samoa. I am firm in my belief that ‘being retired is tiring!’ Thus the cruise. Let us start with a question that has political/social ramifications that are earthshaking. How many days can one man eat bacon at a breakfast buffet on a twenty-eight day cruise? Before I answer, I would like to point out that a woman will spend two minutes attempting to separate two slices of bacon from a ten-pound mound of bacon that is stuck together. Of course, this is all done in front of an extensive line of hungry men. When I finally got to the awaited mound, my only concern was whether or not I could get the 6″ tongs to spread open to 8″. Over the length of the cruise, I did coerce those tongs to accommodate manly servings, lest I feel shortchanged. To answer the question. A mound it was, and a smaller mound it shall be! I ate bacon 27 of my 28 days onboard! I decided one morning, on the 21st day, that I should experiment with some of the other fine cuisine offered at the breakfast buffet. As a result, I climbed out onto the epicurean limb and had pork link sausages. The last seven days were again devoted to bacon. Old habits are hard to break! To support my bacon habit, I am now convinced that Princess Cruise Lines has a hog slaughtering operation somewhere in the bowels of that ship. Thank you Princess Cruise Line! Despite all the many advantages, entertainment and adventures available on a cruise ship, there are, inevitably, some disadvantages. On a 28-day cruise, we had nine ports of call. The remaining days were spent at sea. You have to be able to find your own, comfortable entertainment on these ‘sea days.’ Grandma P worked on crafts. I read 11 books and played trivia twice a day. (I’m not bragging, but our team bested 30 other teams 10 times on 35 occasions. OK, I’m bragging. Get over it.) Even though every cabin has a TV, you are at the mercy of satellite reception for programming, news and sports. Most of the time, we did receive the BBC news channel. The BBC will tell you everything you want to know about what is happening in India, Pakistan, Indonesia. On occasion, we received the Fox News Channel. This news was closer to home and certainly with a keener eye on American happenings. MSNBC was available about half the time. Nothing is more relaxing than to be on a vacation and watch your portfolio tank. The three biggest news stories during our cruise? The second was the typhoon that devastated the southernmost islands of the Philippines. The third news story, 24/7 was the exasperating rollout of the Affordable Health Care Plan, alias Obamacare. We saw Congressional investigations being conducted, politicians scrambling to propose modifying legislation, rhetoric about the advantages and disadvantages of the program – all of this absolutely dominating any US new coverage. My question is this. How long does it take to realize that when you put lipstick on a pig, you still only have a pig? (I bet you did not see that segue coming!) 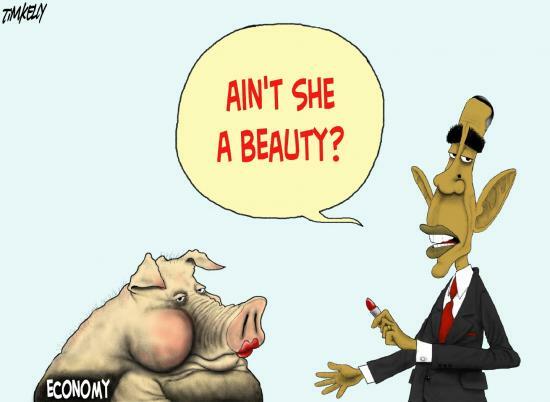 Common sense indicates that most people would realize that a pig with lipstick is still just that—a pig. But Congress is not that astute. Congress passed a law which they did not read, thereby instituting a program they had no idea how to manage, yet they are surprised that the American public disapproves. It appears many Americans are being harmed by Obamacare, because they have lost their former insurance policies! Is anyone going to be held accountable for this disaster? Will anyone in this administration be held accountable for anything during this President’s term in office? IRS targeting? Obamacare? Obamacare roll-out? Benghazi? Here is my Grandpa T Common Sense Solution for the Affordable Health Care Act. Repeal it. It is a pig. The lipstick, all the changes being proposed, are not making it look any better. If the people of America want a comprehensive health care program, enact a program that is comprehensible, fundable, realistic – one that contains medical malpractice liability limitations. My advice? Balance an over-inflated budget first. Our need-to-have programs are much more important than our want-to- have programs. Federalized health care falls into the second category. The ‘want-to-have’ programs are typically put in place to purchase votes. Do your jobs! Enough is enough! Note: Enough is enough – unless you are talking about the amount of bacon on a breakfast buffet on a cruise ship. Princess Cruise Line is our cruise line of choice. Grandma P and I have been fortunate to be on their ships over 112 days in the last 42 months. We have enjoyed each cruise immensely. I want to thank my six-person trivia team. It amazes me that five normal people could have so much useless crap in their minds! ‘Grandma and the boys’ were a great team. Today is the 50th anniversary of the assassination of President John F. Kennedy. I was a sophomore in high school sitting in math class when the announcement was made. It was the equivalent to the baby boomer ‘Pearl Harbor.’ I will never forget it. This entry was posted in Common Sense Solutions, Congress, cruising, Growing Up in America 65 Years Ago, IRS, Obamacare, Political Insight, Political Opinion, Politics on November 24, 2013 by Grandpa T.